I am so excited to be over at Brooklyn Limestone today. If you are visiting from over there: Welcome! Thanks so much, Stefanie, for having me today. This year my Halloween door wreath is all about a geometric take on a spider web. Lots of triangles woven together to make this sort of half a star out of black straws. Here is a long tale of how I got the inspiration. Last Christmas a friend of mine, Anu from Nalle's House, made these adorable Finnish Himmeli ornaments. I was inspired to think about other ways I could use this same idea with straws and thread/wire. One day, I was playing with Geomag magnets with my son B. Among other things we recreated this wreath based on this great wreath tutorial by Vintage Revivals. As I was looking around our office where we were sitting I saw Frank's Geomag 'Rhombic Hexecontahedron' - a going away present he got shortly before we moved to California. Of course I didn't actually think: wow, there is the prettiest "Rhombic Hexecontahedron" I ever did see, because that is such an unusual fabulous phrase and even seeing it spelled out I am still not quite sure how to pronounce it, but it sure seems fancy. So let's go with it. It's means that kind of star shape that my door wreath is made of. If Google has any say in it. I thought part of that shape could be an interesting geometric take on a spiderweb. I used 70 pieces of 6 inch black straws (cut to length), putting them together with floral wire. Using 6 inch straws will create a finished wreath of about 21 inches. Perfect for my front door. This entire wreath is made of triangles woven together. To make the first triangle, put three straws on a long piece of floral wire. You can extend the floral wire as you go, so make it about a yard or so long at first. That way, you don't get too many tangles. After threading three straws on the wire, twist the end of the wire to the end of the third straw to create the first triangle. Add two more straws, then go through one of the straws in the existing triangle to add a new triangle to the first triangle. Continue this until you have a pentagon consisting of 5 triangles as the image suggests. I have to tell you that this is one of those projects where making the craft is actually easier than the explanation would have you believe. Once you sit with the project, it makes much more sense what needs to happen. But, by all means, let's continue this tutorial. Who is with me? This is what the top of the inner form looks like when finished. A pentagon consisting of 5 inter-weaved triangles. For the next step, it is easier to explain as a flat shape, so imaging the outer edges of newly created pentagon for the top in a straight line, if just for the sake of easy explanation of the next steps. You see the outer edges here in a lighter gray color. When you make this project, your shape will still be in a pentagon shape, but in the next step I flattened it out on the drawing. See below. Each straw at the edge of the top pentagon - here seen gray - will get another triangle attached to it by 2 straws each, to complete each triangle making the light gray straws (for visual purposes on the drawing, but your straws are of course still black.) of the existing pentagon the third side of each triangle. Then, each triangle tip will be connected with a straw at the bottom. The right most bottom straw gets connected to the left most triangle in the drawing, creating a circle of a total of 10 triangles under the pentagon. The easiest and shortest route to connect all the straws, as far as I can tell, is by following the numbered arrows. Some of the straws you will have to go through twice, but not many. There are a lot of different routes you can take, which will probably all work, just using a bit more wire. But that's ok.
Once you have completed these steps, you should now have a half dome consisting of 15 triangles - made up of 25 straws. It's all downhill from here. Promise. To complete the wreath, take a look at the half dome and notice each of these 15 triangles that it consists of. To each of these triangles, you now add a pyramid of three straws for the final steps. This will create the star shape. First you add two straws for one of the sides of the triangle you are creating, then go through a straw in the base triangle, then you add another straw to complete the pyramid. Go through one of the first two straws of the pyramid. You should then end up at the corner of another one of the 15 triangles, then repeat steps nine and ten until all 15 triangles have pyramid tips. You will use 45 straws for this. Three straws for each pyramid top of each of the 15 triangles. Again, this makes so much more sense once you actually do the project. If all of this wasn't complete nonsense, your creation should now look something like this. As you complete the shapes the wreath becomes more and more sturdy. I hung my wreath on my front door using a Command hook. I painted the tap on the hook black with a Sharpie to make it less noticeable. We bought the black straws at Smart and Final, the wire at Joann's and a black velvet spider at Oriental Trading. I hung the spider using double stick foam and then tied some black thread between the spider web and the spider to make it look like it was hanging from the web. Tutorials for the other projects can be found here: 5 Halloween ideas for your front door. 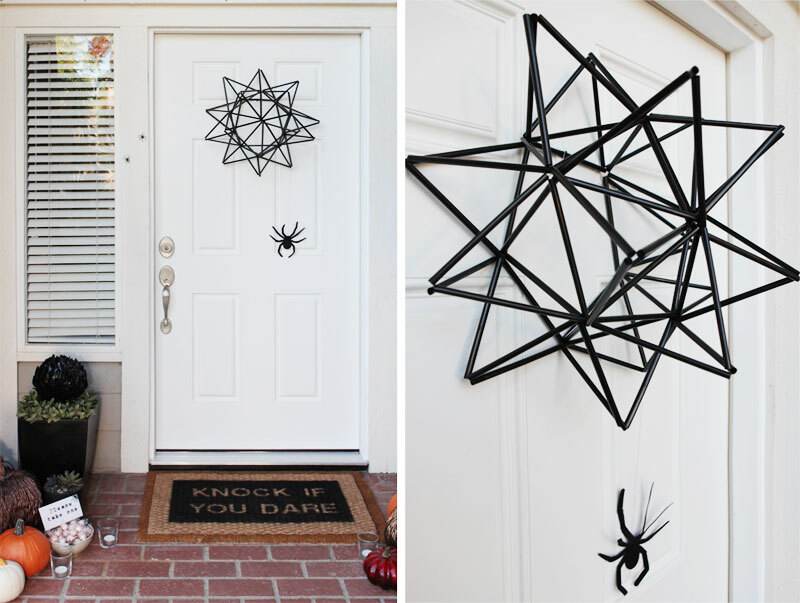 This article: Halloween straw spider web door wreath first appeared on http://ahomefordesign.com.